Many riders aren't enjoying the process of training or learning to ride (especially dressage). There could be many reasons for this, but often I can trace it back to an underlying belief about the process. Here's some common beliefs that set riders up for frustration and disappointment: Horses should do what you tell them. If you apply the right aid, it should work. There is an underlying assumption of obligingness. Horses have been domesticated and bred to work for us for centuries. That's where the assumption comes from. The idea that horses should work for us or that aids should work is often the root of disappointments, frustrations, (and abuse) that we see many horses enduring. My belief is just the opposite. I think: None of this should work. Sometimes I stop in a middle of a ride and I marvel with amazement that dressage (especially to the upper levels) is even possible…. It’s as unreal as teaching calculus to an alien. Maybe you would think that after decades of being a professional horse trainer that I would take the process of training for granted. Instead, the longer I do this, the more amazed I am. Many of the problems that we see in the horse world today stem from riders demanding performance instead of appreciating effort. So often I see riders (even professionals) getting angry at their horse or angry at themselves. They say things like, "He needs to listen." "He can't get away with that", or "why is he doing this to me?" as if horse training was supposed to be easy, and it's just supposed to work. I've observed trainers of other species (like Jennifer Zeligs with her sea lions) and there doesn't seem to be the assumption of obligingness that I often see in the horse world. Because of the generous nature of horses, it seems a lot easier to have some success with a horse than with a sea lion or tiger. That's the beauty of horses, but it's also what makes them vulnerable to abuse. It's easy to take their compliance for granted. Years ago, I was at the house of a multi multi multi millionaire. He said to have a seat because he wanted to turn on the TV to check on a basketball game (this was before smart phones or even cell phones). There was no TV in the room, but he hit a button and a HUGE screen came down from the ceiling and a projector popped out from behind a bookcase. I wasn't sure if I was in a movie theater or on a basketball court! I asked him: "Do you ever just stop and look around and think: This is so freaking cool!"? Maybe he was trying to be humble or not seem egotistical but he said, "With more money comes more headaches." I thought: What a shame. 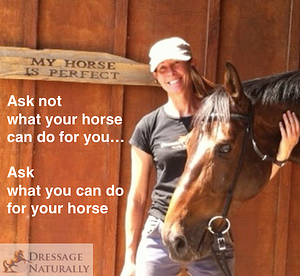 What would it be like to be truly appreciative of the gift our horses give us by allowing us to ride them? Think about it. Riding horses really is a gift. If you have ever experienced a horse that truly says NO, you know that no human can really make a horse do something once he decides not to. Most of us are truly lucky. Most horses are very forgiving of our inadequacies and they do oblige, yet I wonder: Could we, everyday, hold it in the front of our mind that it's a pretty freaking cool thing that we get to ride horses, especially doing stuff like dressage? We can still progress, we can still have high standards, and we can still rise to high levels of precision while also understanding that a horse's willingness to oblige doesn't automatically give us the right to demand. When we practice appreciating them fully in the daily easy moments, we will be better for them in the challenging moments. We all know it’s easy to be happy with your horse when they are going well. The real truth comes out when things are not working. 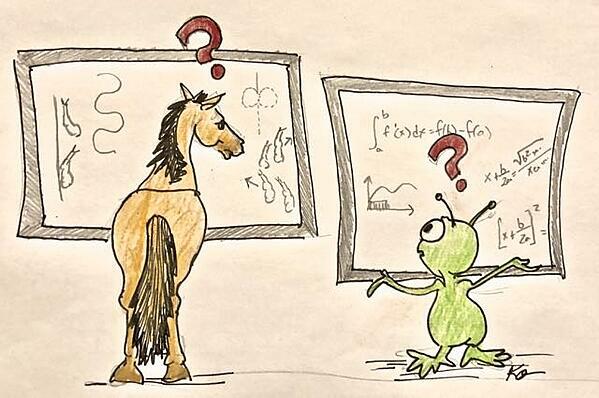 The measure of a system, the measure of a horseman is what is done when things don't work according to the plan. Those are the moments when we need to look at the big picture and remember that it's a gift they let us do this at all. We need to remember that all horses are perfect until we come along and ask them to do something that they cannot yet do. Those challenging moments are when we really need appreciation and curiosity. Whatever the problem is, we're responsible for figuring it out. Just because horses have been beasts of burden for centuries doesn't mean that this individual horse in front of you right now needs to perform simply because you said so. Dressage is an art. It's a gift. Our horses owe us nothing. Don't assume your horse needs to do anything for you. Thank your horse. Replace a few 'Good boys' with 'Thank you'. See if you can feel the difference. So yes, even with all my experience, I still marvel at the process of training everyday. The day I stop enjoying the process of training is the day I should stop training horses. Next time you're out riding or training dressage and your horse feels even just a little bit wonderful, see if you can do this: Stop, thank your horse, and say out loud: This is so freaking cool!